"Lentils are cooked in a flavorful chili along with carrots and celery." Heat the olive oil and melt the butter in a large pot over low heat. Stir in onion and garlic, and cook until tender. 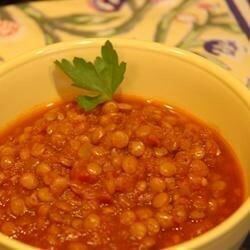 Mix in lentils, tomato paste, and crushed tomatoes. Pour in the water. Season chili with chili powder, cumin, paprika, salt, and pepper. Bring to a boil. Reduce heat to low, cover, and simmer 30 minutes, stirring occasionally. Mix carrots and celery into the chili. Continue cooking 20 minutes over low heat, until lentils, carrots, and celery are tender. This was okay, but it needed more flavor. My husband didn't like it at all.